WINNER of UV Painting Competition! What wonderful news I have to tell you all – I recently won a very prestigious competition! 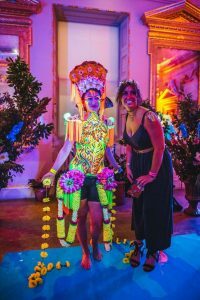 Paintopia and Cameleon Paints started a new Facebook page and filled it with face and body painters from around the world. Together they are wonderful at inspiring and supporting face and body artists worldwide. 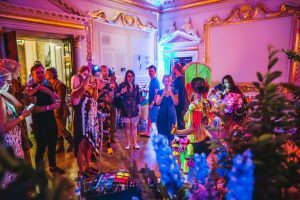 I noticed they were running a competition in all things Ultra Violet face and body painting and my mind drifted back to one magical night at The Royal Academy of Arts where I did a piece of performance art in one of the beautiful rooms at Burlington House during one of their RALates events. 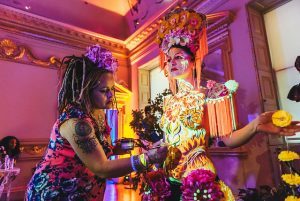 These events are so lavish and I was honoured to be asked to create a live body paint in UV paint as a public performance. I spent the weeks leading up to this event in the workshop at the bottom of my garden making costume accessories to accompany my design. I like to change the silhouette of the human form, making the final vision bigger and more flamboyant. When we arrived on this special evening at The Royal Academy of Arts, we walked up the famous steps and round the corner into the room we would settle to paint. I gasped when I saw the most opulent flower arrangements that sat either side of my performance space. They were very tall, very wide and filled with delphiniums. My model, Tatiana Moressoni changed into her costume accessories and we set about taking our place between the delphiniums. My assistants shone powerful UV torches on Tatiana as I painted this wildly bold design. Well, I had the most amazing evening. As we painted, guests watched the artwork unfold. People stayed, asked questions and drifted in and out as they enjoyed all the activities laid on at this RA Late. You can see more pictures from the evening on this Flickr page. 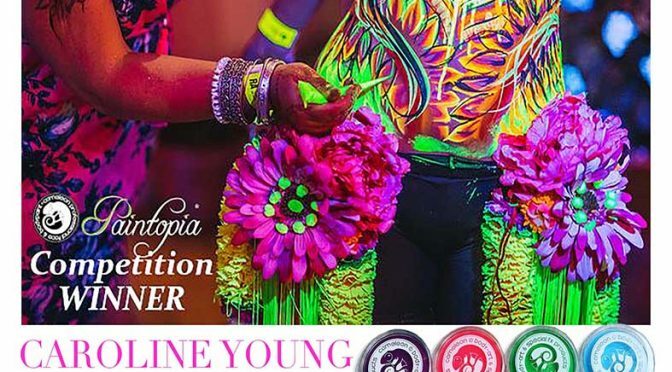 Are you a face or body painter and are wondering which UV paints to use? If so, I can wholly recommend Cameleon UV paints and you can buy them here.